In my last empties post (which was also my first) I said I don't do empties posts because I don't finish products very often and I don't have the space to store empties to save up enough to do posts like this. A few days ago I noticed I actually have several products that are all going to finish around the same time so I thought I might as well do an empties post. 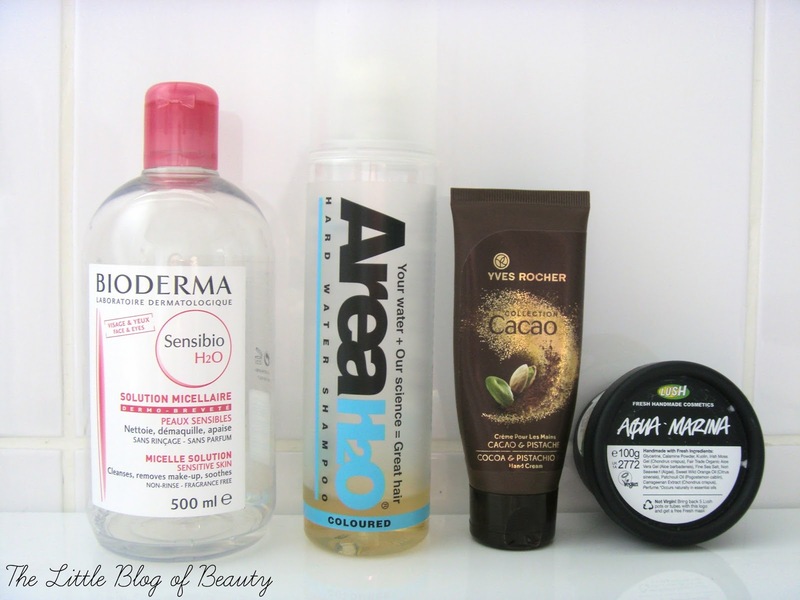 Considering this is only my second empties post, both of them have featured Bioderma Sensibio H20 solution micellaire. I won't talk about this again here as I talked about it last time but you can check out my previous post if you want to know what I thought. Would I repurchase? As I said last time yes I would but I still have another 500ml bottle to get through and then I think I might try a few cheaper versions to see how they compare. At the very end of last year I took part in the Area H20 healthy hair challenge and tried out the Area H20 hard water shampoo for coloured hair*. I also tried the matching conditioner but as is always the case the shampoo has run out first. I know technically this hasn't actually run out yet but there's only a couple more washes in it so I thought I'd include it. I've really enjoyed using this and always find that my hair is much softer and just generally feels nicer after I've used this. I've also been trying out reverse washing with this and the conditioner and I've found it to work really well. Would I repurchase? Although the packaging is not the most attractive (I know, I'm shallow) I like how it makes my hair feel so yes I would. It's more expensive then I would usually spend on a shampoo but I wouldn't say it's overpriced. I have some other shampoos to get through first though. The Yves Rocher Cacao Collection cocoa and pistachio hand cream came in a Glossybox back when I still received them. This absorbs quickly, smells really nice and the best part was it was only a couple of pounds. However I think this was limited edition and I can't find it on the website so I don't think you can get this anymore. Would I repurchase? If it was still available yes I definitely would but in the raspberry version they also had available at the time. As I said in my post back in April (post here) I used to use Lush Aqua Marina face and body cleanser but had not bought it for a few years. I like this because it helps to calm the redness on my cheeks and is great for sensitive skin. Would I repurchase? Yes definitely. As I said I've repurchased it several times in the past and will again in the future but I do have another Lush cleanser to use first.